I’ve been craving change. Does that ever happen to you? I tend to do that with a lot of things, and I don’t think it’s blogging syndrome. 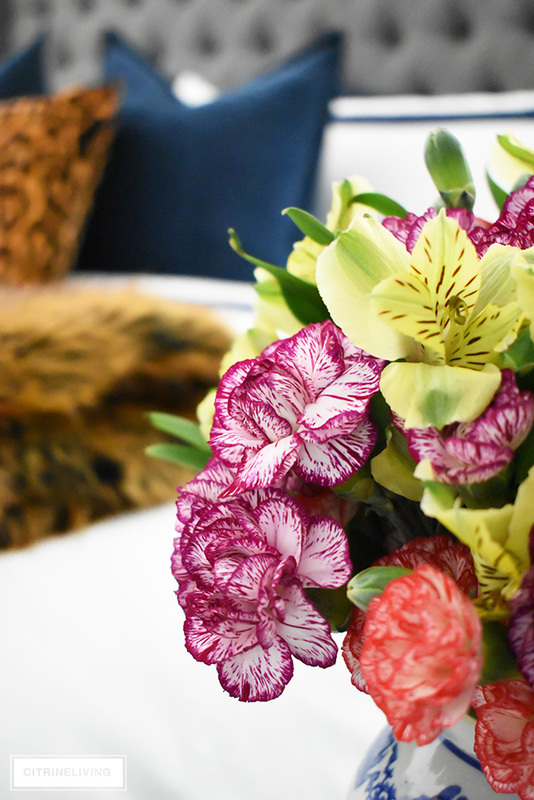 I’ve always loved to experiment with my decor and have fun mixing color, pattern and texture around our home. I also love clean and classic interiors and I decided it was time to try to ‘up the sophistication factor’ in this room, while still keeping an element of pattern that I love so much. 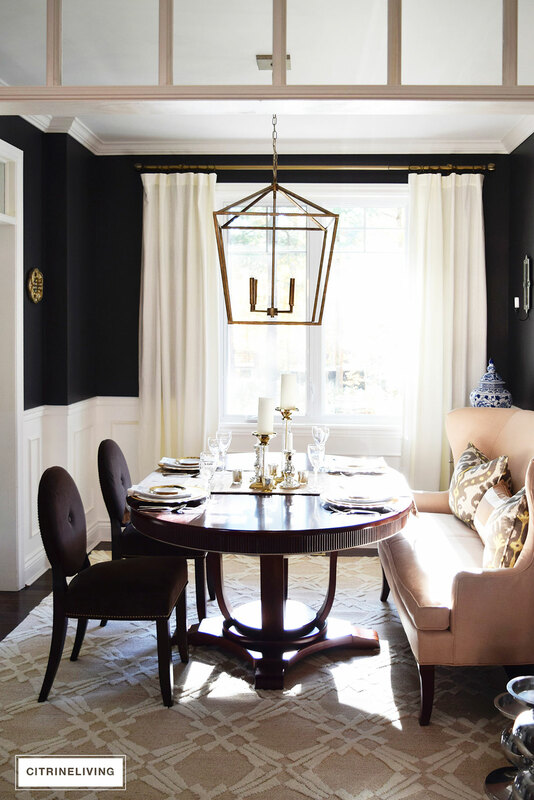 I’ve been talking recently about adding some updates to our dining room, and if you follow along with me on Instagram, I recently shared a couple of sneak peeks of our now neutral dining room, which you’ll also see here today. 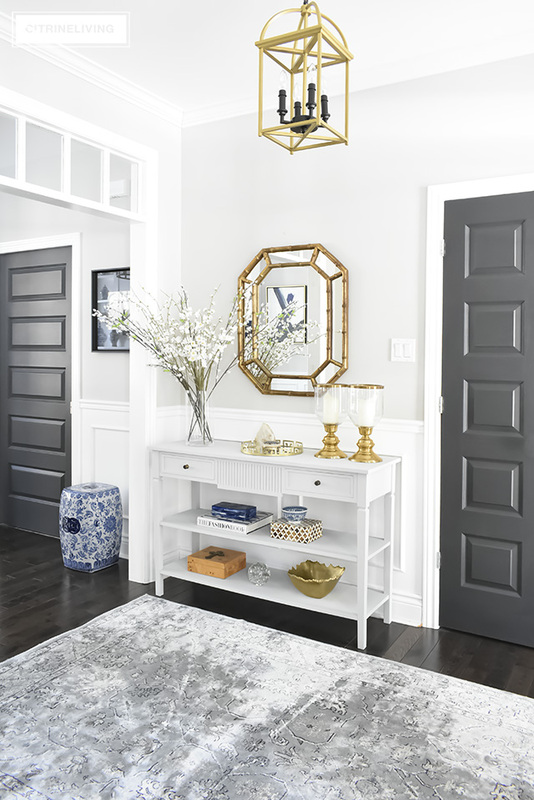 Last week on the blog, I also shared a little peek of our white drapes in my latest living room post (my newly recovered ottoman and diy gold leaf tray), which you can read all about here. 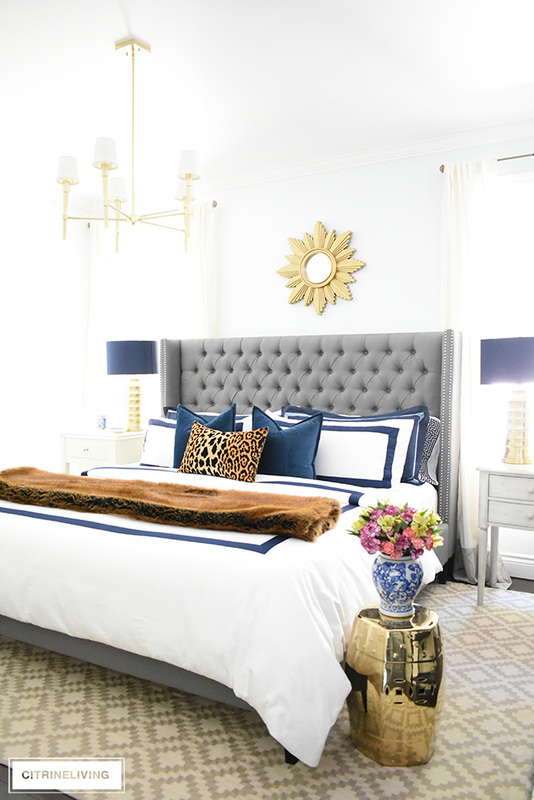 I’d been searching for a light colored rug to brighten up our room for quite a while, yet I knew I still wanted to have something with pattern – enough pattern to still make a statement. I came across this gorgeous rug from Wayfair, made by House of Hampton. I LOVE the tone on tone color and the texture is divine. Our bunny, Oscar loves it too ;) In fact, he very was instrumental in the drapery decision as well (I’ll get to that in a minute) – these are my old drapes form Ikea, which we had in here when we first moved in, for a couple of years. While my beloved ikat grey and yellow drapes brought me so much happiness for a few years, their time had come to an end. The reason Oscar helped drive the decision for change was that he loved them too, a little too much, and he loved to chew them, and chew them, and chew them…my oh-so-chic drapes have now seen much better days! I was never able to let them fully hang down, and they were always draped over a chair or a stool to avoid the wrath of Oscar…not so fun finding holes in your beautiful drapes. Thankfully, he has no interest in eating these ones, so I can leave them hanging all the way down to the floor, and I’m very happy! This is a much more subdued and low key, neutral palette, then our previous look, but I am loving it! 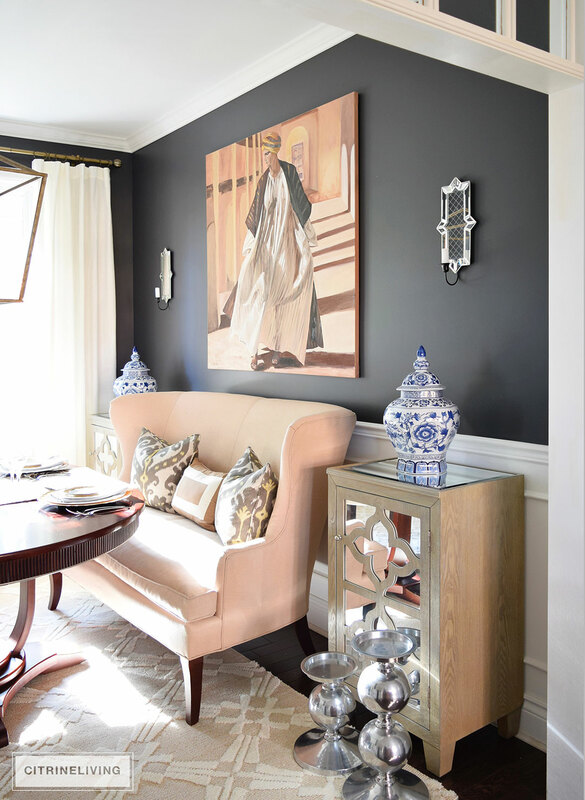 I was even thinking about painting the walls a light color before I decided on bringing back these drapes – it’s as though I’d forgotten completely about how bright this room actually can be, while still having a dark wall color. 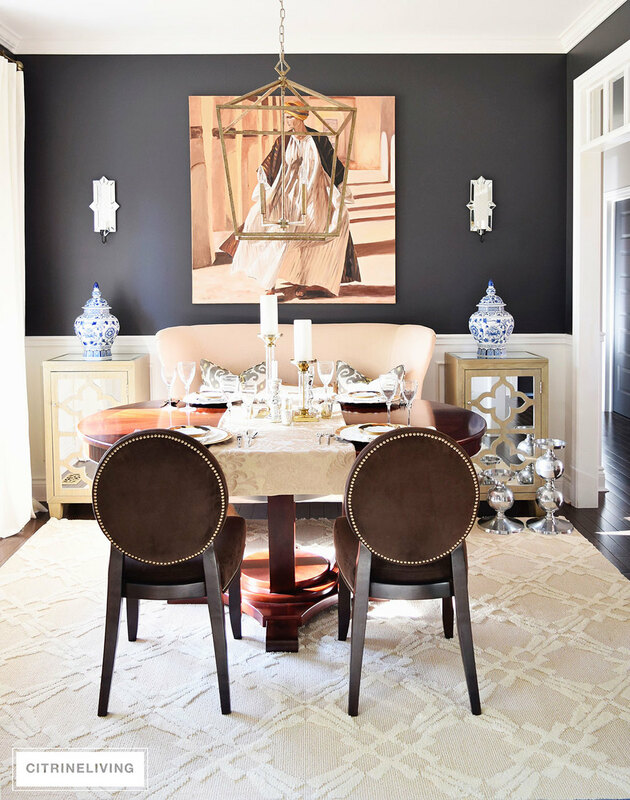 I’m so happy I kept the black walls – Cracked Pepper by Behr Paints – and I love the more classic look of our original design plan in here. I would love a soft pattern on the drapes eventually, something graphic, yet very light. For now, I’m settling with these until I’m ready commit to new, custom drapes. These drapes aren’t lined and unfortunately, sometimes you can see the black wall color through them just a little, but that doesn’t bother me so much. Nor are they pleated, which is my favorite look for drapery -it’s crisp and elegant and classic. I can live without either of those things for now because these bring in the lightness I’ve been craving for so long now. 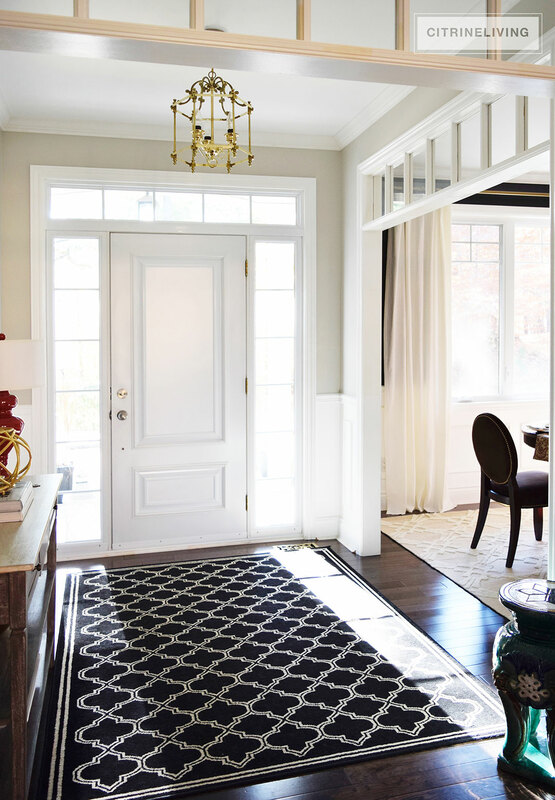 This room, which is quite a small space, now feels much larger and even more opened up – the rug visually ‘pushes’ the walls outward – creating the optical illusion of a larger space. The drapes let in much more light, and on a sunny day, it’s just glorious in this room. Oscar loves it too and always sleeps under the table. He’s beige and fluffy and he’s the perfect accessory, as long as he’s not chewing anything, that is! What I really love about our dining room now, is that I have the ability to play with more color in my accessories and tablescapes. Below is how our room looked before, which I adored with all the layers of contrasting pattern. I had bought the navy rug for our patio, but decided on a whim with my girlfriend to try it in the dining room. It was love at first sight for me, and it stayed there until now. You can see more of this look here. See what I mean about that sunshine? 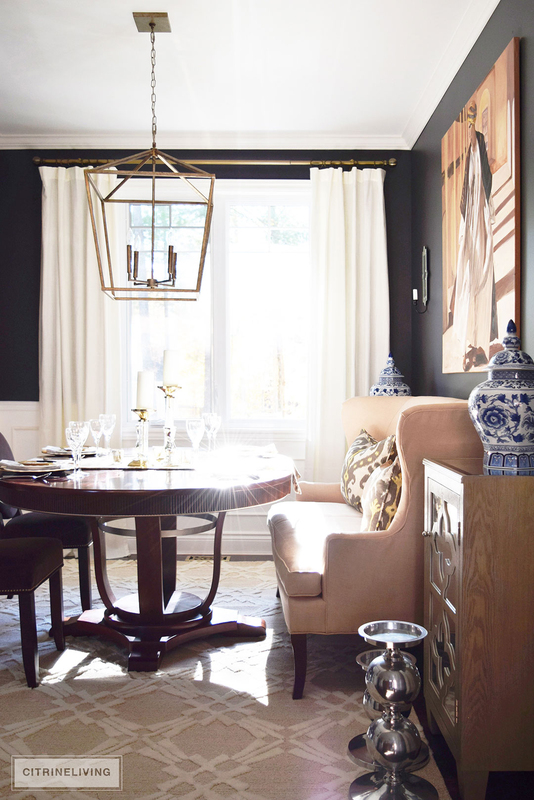 The natural light we get in here coupled with all the white and cream tones help to temper the black walls. This color isn’t for everyone, but trust me, it works in the right environment, even in a small space. 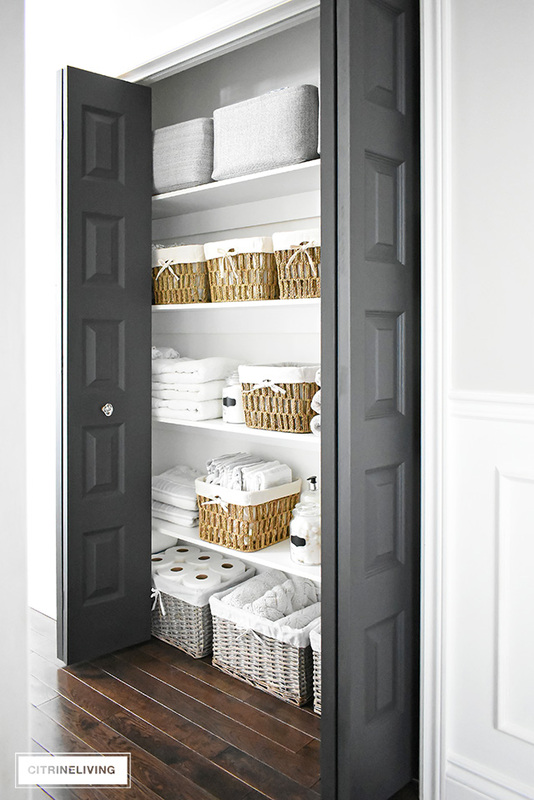 It also ties in with my black interior doors throughout our home which are also painted Cracked Pepper. Tell me what you think! I want to know – did you like the eclectic mix from before or the more classic sophistication we have now? Tam, I love the new look, you are right, so bright, crisp and elegant. I think the walls are perfect, they are so dramatic and now with the new rug I think that is the perfect combo. Now the one thing I do think that should change is the painting on the wall, I really think you should change it, and as a good friend, I would be happy to take it for you (hehehe), you know how much I love that painting. You are so talented and once again you hit it out of the park. Tamara, it was gorgeous before but I am really loving this neutral update! I think it will be perfect especially for the holidays and let all of your holiday decor really stand out! This is truly exquisite, my friend! Well done! ???? Tam, I absolutely LOVE the white drapes against your black walls. So sophisticated and crisp. I see your black walls and want to start painting mine all black…don’t change them! Oscar is such a turkey! That’s so funny he doesn’t like the new drapes, he must love pattern too..lol! It’s probably no surprise (you know I love my neutrals!) 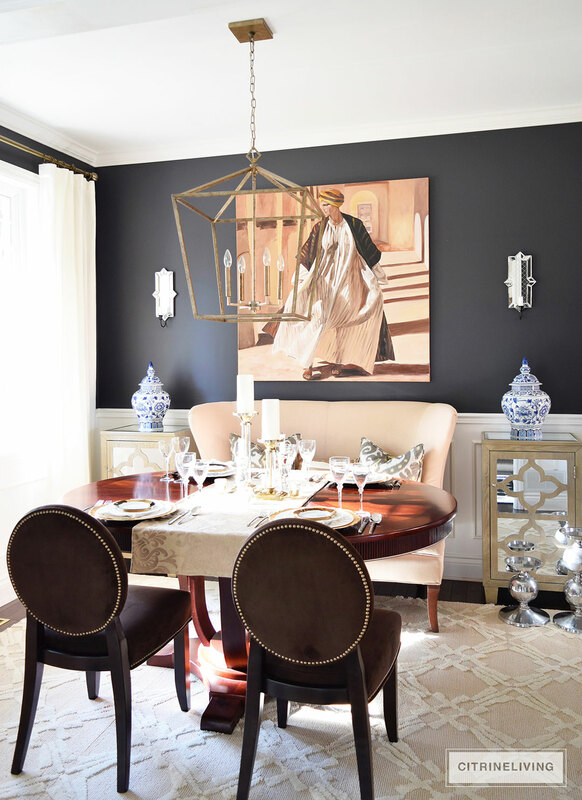 but I adore the changes you made to this room – it looks light, bright, and elegant! And I’m so glad you left the walls – I have always loved them but think they look even better with your new drapes and rug! Have a great weekend Tam! 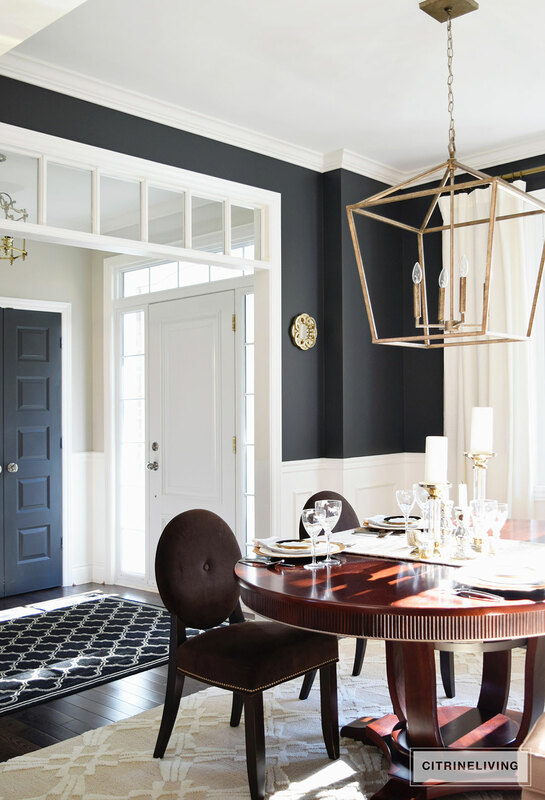 Hey those circle back dining chairs re gorgeous, where did you find them? Yes I was going to sk the same thing . Where and what color r they? Hi Michelle, I’ve had these for so long and they’re not available anymore..I was lucky to find them! Thanks so much for visiting! Thank you! I’ve had these for a very long time, I bought them at Home Outfitters (in Canada) and I haven’t seen them since…a luck find! Thank you for stopping by! I love the painting against the black wall. Stunning! Does the painting have a name? Thank you so much, Maree! No there’s not name, but my mother painted it as an engagement gift for us..I’m so glad you like it! Thanks for popping in to say hi! I came across a picture of your dining room on @kristywicks Instagram page & immediately fell in love with your dining room. So much so that I have committed to recreating the look in my own space. I’m almost there, but I’m having a terrible time finding the chandelier. Do you mind sharing the manufacturer? Gorgeous dining room. 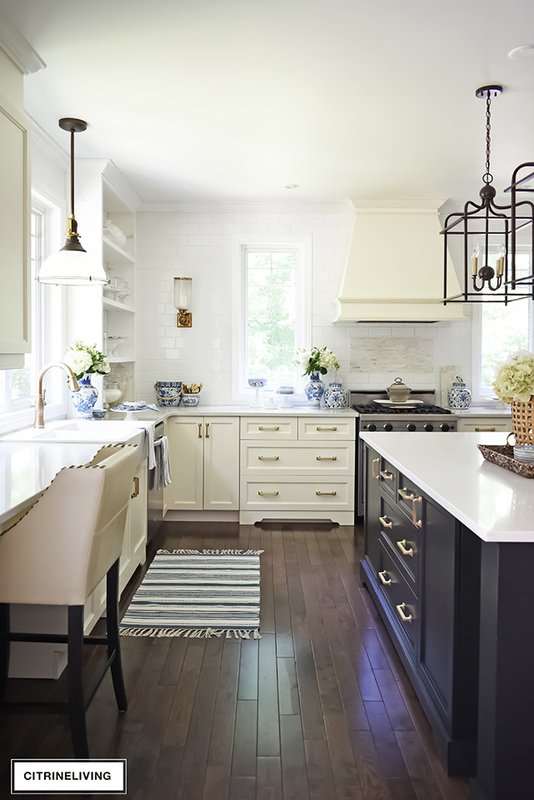 Is your chandelier the 30 inch height version or the 24 inch height? Trying to decide which one to go with. I can’t find a link to your neutral rug, but I love it! Do they still make it? Hi Lori, unfortunately they don’t make it anymore, I’m so sorry! I have a few other rugs linked under the SHOP tab, SHOP MY LIVING ROOM, if you want to have a look there! 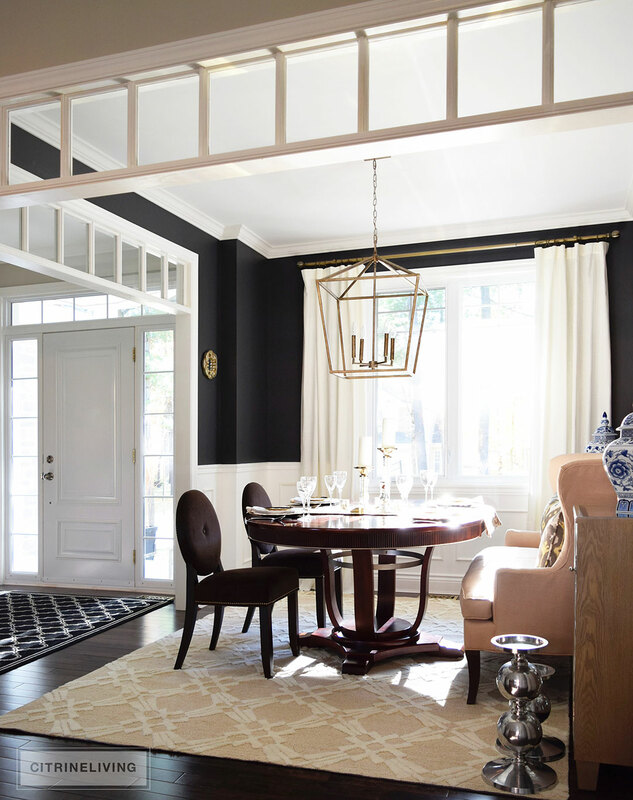 Beautiful dining room with the black! I think you have converted me from a hale navy girl to a cracked pepper girl! Could you please tell me the foyer colors? Love the combination with the black! Thank you very much, Wendy! 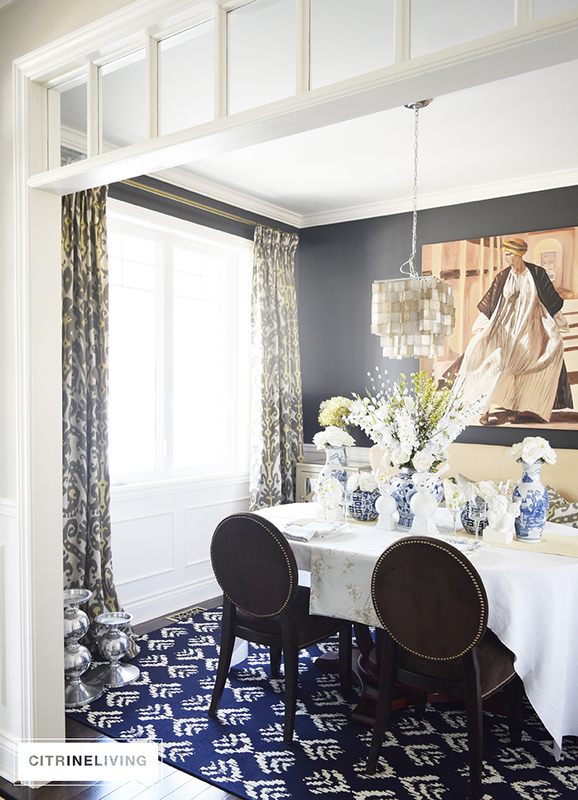 I love Hale Navy too, it’s a gorgeous color, I’ve even contemplated going navy in here! 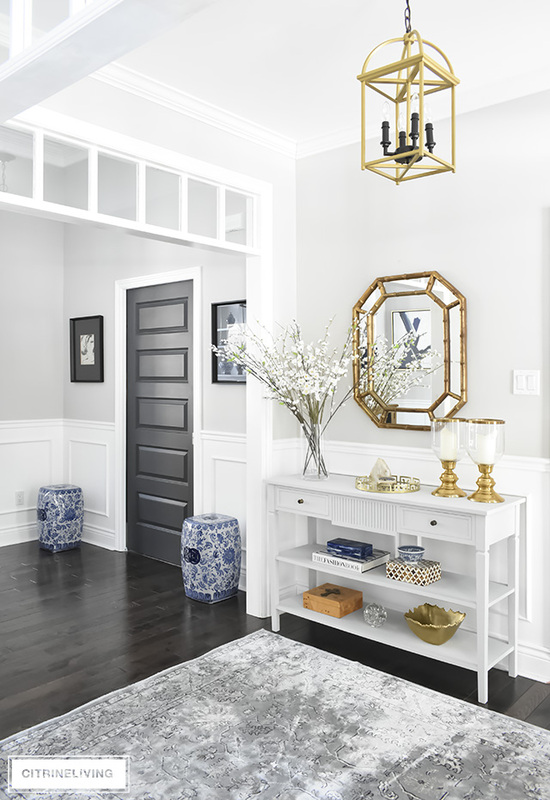 The foyer is Collingwood by BM and all the trim throughout our home is Ultra Pure White by Behr :) So happy you like it!! Thanks for stopping by!